Although my water had broken in storybook-like fashion, I wasn’t having contractions at the time. 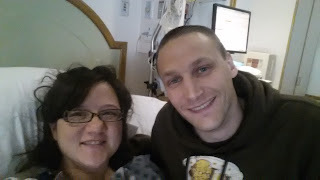 In labor-land, this means that the doctors started me on a Pitocin drip in order to encourage my contractions to start. They were mild enough at the start that I was able to rest my eyes for a bit, although I couldn’t sleep; the adrenaline and excitement coursing through me wouldn’t allow for that. H slept on the sofa in the room while I shifted in bed. Every few hours, they upped the dose and the contractions intensified. The morning rolled around and I had shifted position. I moved to a chair and rested my head on the bed. My knees were set apart to rest my enormous belly between my thighs. I breathed through the contractions as they pulsed through my body. The sensations weren’t painful, but they were uncomfortable. Around 11:00am, I was told that it would probably be another six hours before I would be ready to deliver the baby. I thought about whether I could handle another six hours of this and decided to ask for an epidural. The anesthesiologist came around after a few minutes. (“You’re lucky, he’s the best in the hospital,” the nurses reassured me.) The whole process was uneventful, and I was soon resting comfortably. I spent most of the day trying to nap and sending last minute school emails and anticipating the ever-nearing time when I would get to meet my new son or daughter. Around 5 or 6pm, the doctors came to check on my progression. The good news was that I was fully dilated and effaced. The bad news was that the baby was still at zero station. I was also starting to get some chills and was starting to run a fever. The doctor suggested that I try laying on the “peanut ball” to see if shifting position would help the baby descend. I started to get particularly emotional at this point. The contractions were getting stronger and I knew that, minute by minute, I was inching closer to finally meeting my son or daughter. After about 30 or 40 minutes the doctor came back to check. She checked my temperature and looked at the monitor and shook her head. I was nearing the 24-hour mark past when my water had broken, but I still had options. I could try pushing for a few hours to see if the baby would descend, but it might end up just causing more distress and resulting in a C-section…or I could just have a C-section. Put in the context that she gave, it seemed to us that there was no real choice. A C-section seemed like it was the safest means of delivery for both me and the baby. Although I had tried to keep my “expectations” for birth pretty well-managed, I couldn’t help but to feel disappointed that I wouldn’t have the experience I had hoped for. Even worse, because I had been diagnosed with chorio, the baby was going to be whisked off to NICU after birth for monitoring and to receive prophylactic antibiotics. These days technology has become really fast and now normal or c sec delivery don't matter.The only thing which matters is the health and life of baby and mommy.